After the launch of the Samsung Galaxy A8s and the Huawei Nova 4 last month in China, all OEMs are now looking at introducing the display hole for selfie camera design in their upcoming phones. 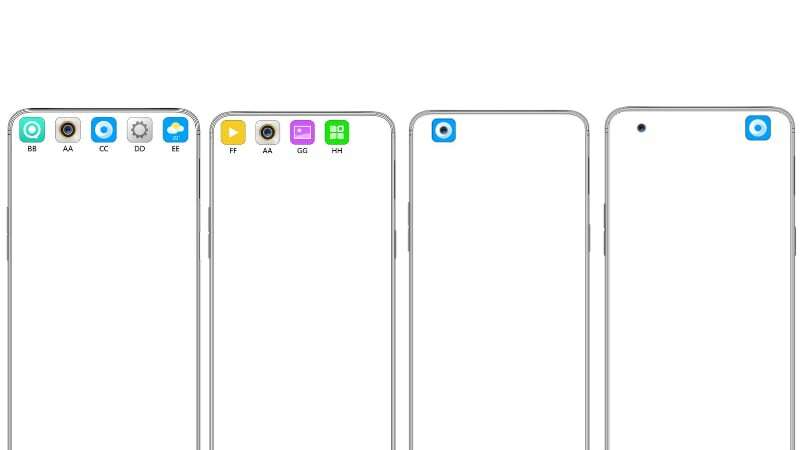 Chinese smartphone maker Oppo is also said to be planning to introduce new phones at MWC 2019 with this new design, and now the company has filed patent applications demonstrating alternate ways to use the punch-hole, apart from integrating the selfie camera. The company’s patent applications include new swipes and actions using the punch hole to enable opening apps and even closing them. Oppo has reportedly filed two applications at World Intellectual Property Organization (WIPO) for alternate ways to make the punch-hole selfie camera more useful. The two patents are titled, ‘Mobile phone with app icon interface’, and they show the selfie sensor inside the punch-hole on the top left edge of the smartphone display screen. The first filing shows a camera icon overlaying the punch-hole selfie sensor cut out, and clicking on it will open the camera app. Furthermore, the patent suggests that swiping right will close the camera app as well. The second filing suggests some sort of an app launcher around the punch-hole camera that will house five app icons. Swipe movement at the top will make the icons appear or disappear. The users can also scroll to make way for new icons to show up. Clicking on any of these apps will open them up. Swiping on the top screen will show the app icons, but the camera app icon, which overlays the punch-hole, will remain at the same place. The patent filings were first spotted by LetsGoDigital. Both these patent applications suggest new ways in which the punch-hole camera can be more useful. It remains to be seen if any of Oppo’s future phones will see these new features. Oppo is set to host an event at MWC 2019 on February 23, and the company is expected to launch the Oppo F19 and Oppo F19 Pro smartphones. The Oppo F19 is tipped to be the first smartphone to feature the 10x optical zoom technology that the company teased earlier this month, alongside a next generation in-display fingerprint sensor with a larger active display area for authentication.